You might be wondering if I've been cooking anything interesting lately, or just writing about the meaning of life and food. Oh, come on -- you probably know the answer to that already. Of course, I've been cooking. The first thing I did since coming home from CIA boot camp was make chicken stock. It is now happily stored in my freezer in little zip lock bags and has even been thoroughly tested out on a mushroom risotto. While the weather was good, we've been eating lots of grilled fish and grilled pork chops. Since the dark secrets of meat cookery were not revealed to me at CIA, my plan B was to apply brute force starting with the pork chops. I tried every tip I've read in Cook's Illustrated: using rib chops vs. blade chops, brining, marinating, high heat followed by low heat. But even after yesterday’s pork chop palooza (trying 4 different recipes on 4 different chops for comparative tasting), I am still stuck in the same rut -- good juiciness and flavor, but still not as tender as I'd like them to be. Jason's solution to the pork dilemma? It's elementary, my dear Watson -- eat fish! When Jason is right, he is right. Besides, it was a perfect chance to try Bea's tuna tartare. Wasabi ice-cream was not going to happen on a Wednesday night, and I improvised a bit with the ingredients, but the key part of Bea's recipe that caught my eye was mixing preserved lemons into the tuna. The reason all the raw fish eaters love tuna so much is it's satiny texture; the flavor is almost non-existent. 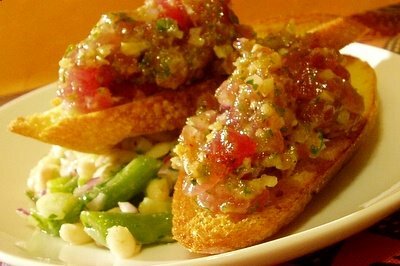 That's why bright, pungent flavors are essential to a good tuna tartare. Preserved lemons with their salty/sweet brininess were just what my tuna needed. Tips on buying tuna: Buy your tuna from a reputable source and store it at home in its wrapper on ice (in the fridge, not the freezer). Avoid buying tuna with pearly rainbows (a sign that it was cut a while ago and got oxidized) and eat your tuna the day you buy it, unless you are planning to cook it. Tips on preserved lemons: You can buy preserved lemons in some Whole Foods markets and specialty stores. They are sometimes sold as Moroccan lemons. You can also make them yourself, or substitute them with lemon zest in this recipe. Preheat the oven to 375F. Brush baguette slices with olive oil on both sides and spread on a baking sheet. Bake in the middle of the oven for 5 minutes. Flip, and bake another 5-7 minutes or until crisp. In a medium bowl, combine the tuna and the rest of ingredients. Mix well, taste and correct seasoning. Spread tuna on toasts, drizzle with a little olive oil and serve immediately. Make ahead note: Mincing a pound of raw fish might not be the best way to spend time when you have company. If serving this dish for a dinner party, you can prepare all ingredients up to 2 hours before serving, but don’t combine tuna with the rest of the ingredients until ready to serve. Wrap tuna tightly in plastic wrap and store it between ice packs in the fridge until you are ready to serve it. Wow, Helen! That is just fantastic. I wish I could have some right now ... and by the way I have so enjoyed your account of your CIA adventures. Well done! If you haven't already, check out "Pig Perfect" by Peter Kaminsky. It's awesomely interesting and entertaining - it will also give you a new way to think about pork. Just catching up with my blog reading and got to find your lovely post. I have to read about your boot camp! I love food blogs just for the fact that I can meet people who don't freak out at the thought of raw fish :) The tartar dish should be awesome with salmon. Foodcrazee, let me know how it comes out if you decide to try it. And Bea, the raw salmon cucumber salad you just posted is lovely. And anonymous, you are absolutely right about pork. After asking around, I found out that Whole Food's pork chops are way too lean.